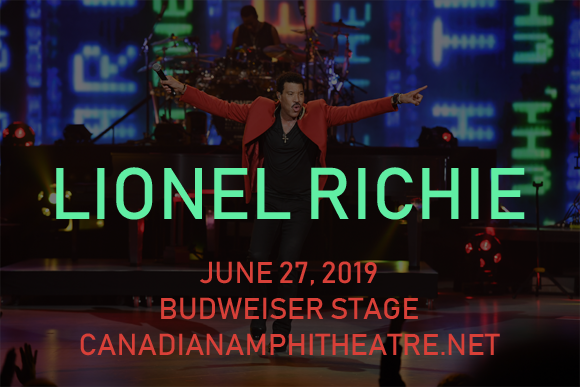 One of the world's biggest balladeers, the one and only Lionel Richie comes to Budweiser Stage on Thursday 27th June 2019 on his Hello Tour! Promoting his brand new album Live From Vegas, Richie will be performing all of his chart-topping, groundbreaking hits, and whipping the crowd into a frenzy with his charismatic and palpable stage presence! A veteran professional still riding high at the top of his game, Lionel Richie always delivers an unforgettable show – tickets available now! Lionel Richie first made his name in the late-1970s and early 1980s as lead singer and saxophonist of funk and soul band the Commodores, who had a string of hugely successful hit singles including "Machine Gun," "Brick House," "Easy," "Three Times a Lady," "Still," and "Sail On." The American singer, songwriter and multi-instrumentalist went on to embark on a solo career, releasing his debut solo album in 1982, launching the hit single "Truly", which reached number one on the Billboard 200, and the top five hits "You Are" and "My Love". He followed with numerous smash hit singles, including “Endless Love," "All Night Long (All Night)," "Hello," "Say You, Say Me," and "Dancing on the Ceiling", and has now established himself as one of the best-selling artists of this century, selling over 100 million records worldwide. Throughout his illustrious career, Richie has won four Grammy Awards, one Golden Globe Award and an Oscar.